Progression server quested item only. my pottery skill was at 241, modded is at 252. i tried the combine on my shamy. buffed my self to 305 str,sta,agi,dex. 355 wis and 280 int, 220 cha. i made my gm alchemy bag at 180 first try. i failed 4 times trying to gm pottery. was wondering if you are allowed to have 2 gm items. also my friend gmed fleching then tried to gm brewing 11 times and failed every time. he was 251 unmodded in brewing. has anyone made 2 trophy's? Yes, you can have multiple trophies. In fact, I believe you can have up to nine -- seven for the general tradeskills, one for poison-making, and one for tinkering (if you're a gnome rogue, of course). I myself have seven trophies. It is quite common to fail the trophy combine; it's a HARD combine. People get lucky and get it on the first try, sure -- but people also get unlucky and fail it ten times in a row. Of course, since the trophies are LORE, you can't have more than one of the same trophy. My JC is 250 and I have failed 3x w/geerlock at trophy attemp. I had some of the gems but u are aleays missing a few, and it take Dia., Blue Dia, Black Sap, Jacinth, 8 bars of velium, 4 Rubies, an other crap= big pp. But its all about the look of that beauty in your ammo slot. An + 50 char for a chanter aint bad either. Putting AAs in for GM3 then ill try again. ***** the bag got plenty 100% bags. Can someone with the tropy confirm that the trophy doesnt give stat increases in range? The trophy gives stats in ranged what the person said is it doesn't give stat increases if put in ammo slot, no item does. However what it DOES give is tradeskill increase... wich is always good so if you got good stats already ammo is the place for it ;-). 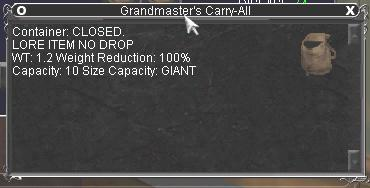 If you do become a Grandmaster in another Tradeskill, Can you recieve another Carry-all?? Hello? Only an idiot would get their trophy just to get this. The trophy is a nice item, so this is just a bonus to a nice item u recieve. #Grunmore, Posted: Jul 02 2003 at 7:00 PM, Rating: Sub-Default, (Expand Post) Actually i would GM a trade skill just for this. A bag that is the same as this but not no drop cost upwards of 6000pp. By GMing a trade skill you can not only make tons of plat, but you can get this. 100% weight reduction, giant bag. Not only that but you get the Grandmaster Trophy, which has some nice stats especially if you are a Enchanter, Necromancer, or Druid...and whoever else might care about CHA for charming mobs or whatnot. how can you say its a waste of time to get a bag that is 100% wr for 2500pp yes i said 2500pp.thats all it takes to get it & ive seen to it myself so i know it can be done. And by the by not everybody in this game runs in guilds myself included i am a solo artist have since first lvl & will contiue to do so from 49 now to 65. so not all of us have or want the need for a guild to get nice items. still took me 7 tries to get my grandmasters eyeglass. So, for those of you saying it is only 2500 pp to get this bag, think again. Sure, many people get lucky and succeed on the first try for thier trophy. Still, it is by no means a sure thing. The "trivial" level is well above the 255 skill cap (with mod, 250 without). Soe hard caps a lot of things to prevent hackers from adjusting values in there ram.. Also 255 is the highest number a you put into a one byte value and in a game as big as EQ memory is at a premium so to me its reasonable that things are capped at 255 so that you can stuf one in an unsigned char... Just my 2cp... I assume that other values are ints or maybe the made a struct with n bitfields and use that... I dunno. probably ints though since a struct with 9 bitfields would probably equal an int. any way I am rambeling. As a level 40 myself, I already have a Rallic Pack (In fact, I was the one who distributed them to my guild) and a Sewn Bag of Evil-Eye. I'm already close to 200 in Fletching, and I expect that I'll get the Grandmaster's Carry-All... but there's no rush, by any means. Actually, My main is a GM smith, and at or near 200 in all the rest. I have a smithing trophy, mostly for pride, and to show to potential customers. I usually use a ceramic shield or valor in range, rather than my trophy, since he is a cleric, and the bonus to buff duration is more important than being able to summon bags. However, I am GMing Brewing for my druid, for the combined purpose of haveing the trophy for range (for the wis/charisma, for charm kiting) and for the ability to summon 100% wt reducing bags. I wouldn't GM any of the hard tradeskills for this item, but brewing is cheap and easy to GM. Well if you have a higher level main or know higher level people and you can get from 5250PP (135 cha) - 6400pp you can have someone take you into Sol A and buy bag from merchant there 100% Weight reduction, weighs 1, giant capacity no drop but NOT lore or no rent. I just bought one with my wizard it is a very nice bag. Same merchant also sells traverlers boots effect traveler's boots 1.5 cast time for those non sowers with money that don't want to camp AC for same price as the bag. Second- Travelers boots have a CASTING time, JBoots do NOT. Which means you can cast JBoots while moving (indeed running) and not be interrupted. Even SoW casters and bards camp the JBoots quest to get the boots. Ever heard of "AoE dispell" ... you will. And it's for just such occasions that people get JBoots. Let's do the MATH shall we? You can spend 15k plat on pottery and get NO Rent tinkers bags in infinite quantity. OR you can spend 15k plat on tinkers bags and get 3 transferable bags. Oh, and let's examine the cost/benifit of the bags. Conclusion: If you want cheap WR bags forget 100% WR. Light burlap sack and EE bag and Shralok Pack will probably run you less than 1k. Another 1k and you have a rallic pack. Grab an Herbalist Pack from CC and an Archeologist pack from Perma and a Kobold Shaman Pouch from warrens/stonebrunt. Leave the last slot for Jboots/tradeskill/quest containers. Even if you take brewing to 250 cheap. (and it is cheap) You still have to buy that artisans seal. Karana save you if you FAIL the first time. Oh, and did you notice that brewing, the cheap trophy, is the only one that requires a Blue Diamond component (corking device) which adds another 2-3k to the price? No, the WR packs for Tradeskill Trophies are a nice -side- benifit. But you need a much more compelling reason to master tradeskills than WR bags to invest the time plat and effort. Actually, they all require a BD for the Artisan's Seal...the brewing one just requires two. Don't get me wrong, I'm not contesting your argument in any way, I agree with you wholeheartedly that getting the trophy just for the bag is more tedious than just going and buying a Bag of the Tinkerers. But the trophy itself is a nice item to acquire. Don't make the trophy just for the bag, you're wasting your time and money by doing it that way. Make the trophy so that you actually get your skill up in tradeskills and make it for the trophy itself. And thats not even mentioning the fact that if you take all of your tradeskills to GM you can get a very nice earring doing the Aid Grimel quest in PoP. Of course that's only if you like questing for questings sake. It will be very expensive in both time (for AApoints as well as skilling trades) and money to become a GM in all of the common trades. A nice bag to have though as reward for the time and energy put into trade skills. I would say the most expensive thing in terms of getting this bag isn't the platinum spent at all but the time it takes you to get a skill to around 250 to attempt the combine. (Admittedly with a 5% skill item you may as well be skill 240 'cos it'll take you to the hard cap at 252 anyway). On Firiona Vie the summoned bags and the end result were tradeable. For a few days period these were being sold and or gifted to half the server population who could then with zero tradeskills turn the bag in for the permanent bag. Seems like VI didn't like everybody getting a free tinker's bag so they shut it down. For those of you that remember.. I get the impression that this bag is a nod from Verant to all the Grand Masters out there who are making their trophies. Since there are a number of new 100% reduction 10 slot bags out there (Haversack, tinker bag et al) that can be crafted, and even traded this is seems like much more work for just a bag than would ne necessary. The no rent bag that Grand Masters can summon didn't go over as well as some thought it might so VI is giving them this as a peace offering. If you are at the point where you are making a trophy then this is just a nice bonus. That's my take on it anyway. If I had all the answers why would I be here? Then you have never seen the Treasure Hunters Satchel. Same stats, less weight. Or a tink bag for that matter. Tink bag is most likely still going to be cheaper... Trade Skill Trophy's are NOT trivial at 250 in their respective skill. (Unless this has changed recently). And that's per attempt, with 5 minor combines that although they can become trival may still fail. Sure baking and pottery are both cheap (as trade skills go) to get to the 200+ range but that also means you're willing to devote the 1 Trade skill you can take above 200 just for bag. *Alchemy, Tinkering, and Poison Making are Class - Race skills and can break the 200 limit along with a public trade skill (Baking, Brewing, Tailoring, Smithing, Jewel Craft, Fletching). So from a cost stand point making the trophy to summon the bag to turn in for the non-no rent reward is most likely gonna run more than the ~5k for a tink bag. Dragon bag's/boxes are a completely different matter. EDIT My mistake, didn't realize Alchemy was still limited to 180, I know for sure that poison making can break 200, pretty sure tinkering can as well. Alchemy can't break the 200 as it's maxed at 180, I don't know for the 2 others though. And well let's look at the Trophy stats, it's far better than a single Tinkerer's bag, it would cost far more than 5k to get an item of this quality. well as a gm jewler with the trophie i can say that i summoned the bag once just to see how it worked and then stoped due to the fact that i dont like no rent bags so if they are gunna toss out a free bag for me thats 100% reduc ill take it no questions asked and btw i spent more then 10k just getting my skill up to 250 and another 5 on the trophie i dont consider the 10k i spent a cost to get the bag becuse i spent that much getting my skill up before the trophies were made. so i see it as spending 5k on a 10str 10 wis/int 50 cha range pri and sec item with a free 100% bag. that is now nolonger no rent. all of you out there that feel that this bag isnt worth it then look at it like that. sure you can go spend 5k on a tink bag but you dont get the trophie. and i can always go get a tink bag when i decide that i need it. just my 2 cp. #TraversePrexus, Posted: Aug 21 2002 at 9:10 PM, Rating: Sub-Default, (Expand Post) It's a european carry all! My monk is kicking me right now trying to make me go get her one of these. Ouch.